Strength Training for Women: A Practical Guide! This is your place for info about strength training for women. There are programs, exercises, and tidbits of info that will improve your workouts. The main thing to remember is thatwomen's strength training is virtually the same as regular strength training. The few differences are important, and it will help you lots to know them, but it's really just lifting heavy things. Now, start reading find one of the programs to start and what kind of strength training is best for you. You can get all the info you need right here. An overview of five kinds of strength training, from weight lifting to yoga. They each strengths and weaknesses depending on what kind of workout you want & the resources you have access to. Get an idea of the kind of exercises that will give you greatest benefit. Look them over and find the exercise that is the best fit for you. A list of 5 basic body-weight and free weight exercises for women. Use these for the core of your exercise program. All these exercises engage large parts of the body (squats for the legs, push-ups for the upper body, etc.). Use them to get an overview of the sort of exercises you will want to do, then go find a program to fit them into. This is a beginning strength training workout for women. It shows you when to work out, what lifts to use, and why you're doing them. 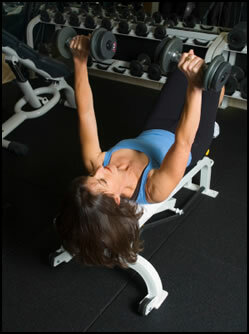 A well designed weight lifting program that you do regularly is crucial to building strength. Don't change your exercises every time you go to the gym; Stick with this one workout and just watch as the weight you can lift goes up! These are alternate training programs you can use to get stronger. Free weight, body weight, and kettlebell programs have all been outlined right here! Use these program ideas to give yourself variety in your workouts. Doing the same think all the time will kill your motivation - so mix it up once in a while and make it fun! Women's Strength Training: 7 Facts! The 7 main differences in women's strength training from men's strength training. Knowing these differences will kelp you plan & get the most from your training. And, actually, they aren't all what you might think of. I was surprised about women's natural changes in testosterone levels! If you capitalize on this, strength training for women is much easier. This info about strength training for women will give you the edge in your training. Good information is always useful and this is enough to get you well on your way. If you like this info about women's strength training, you'll like my monthly E-Zine, Starting Strong. It keeps you updated about new pages and info added to Complete-Strength-Training.com, and includes select articles. You'll also get the free e-book Train Smart, Eat Smart: Exercise Nutrition Hacks! Sign up below! Again, this stuff ain't rocket science; it's simple and not any harder than men's strength training, just different. Start out with a well designed program and work it till you're sweaty and sore, then just keep doin' it! • Click HERE to leave 'Strength Training For Women' & go back to the Complete Strength Training Home-Page!